Hi everyone! I’m Abby – a Wrigley Fellow and first-year PhD student in the Earth Sciences Department at University of Southern California. This summer, I’ve been studying the chemistry of sandy beaches in California, and specifically how ocean acidification will alter that chemistry. Before you jump to any conclusions… let me state for the record that my work involves way more than beach towels and sun tan lotion! Keep reading to see what beach research in southern California is really like! 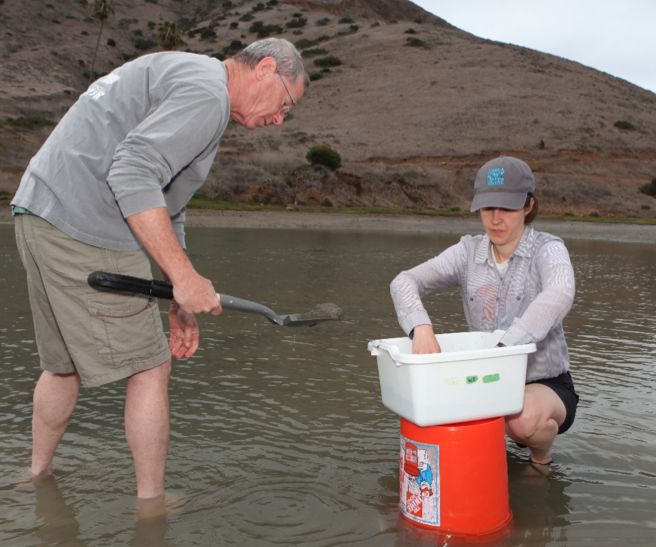 My advisor, Dr. Will Berelson, and I collecting sand from Cat Harbor, three miles from the Wrigley Institute on Catalina Island. To explain what I’m researching, and why, let’s start with the big picture. Imagine earth, with several large continents surrounded by ocean. Earth is mainly a water planet, with 71% of the surface covered in water. Now imagine humans, burning fossil fuels over the past few centuries, and the product of that burning–carbon dioxide (CO2)–entering the atmosphere. We know that some of this CO2 is accumulating in the atmosphere, amplifying the greenhouse effect, and causing the warmer temperatures we’ve all been feeling the past few years. But some of it also dissolves into the ocean. Gases dissolve in water – it’s just a fact of chemistry. So more CO2 in the atmosphere means more CO2 dissolved in the ocean. If you’ve ever used a Sodastream or other carbonator, you know this phenomenon: by putting high pressure CO2 in contact with water, you can make seltzer, which is essentially high-CO2 water. We’re doing something similar to the ocean: “carbonating” it by increasing the pressure of CO2 in the atmosphere. Ocean data collected at Station Aloha in Hawaii shows increasing dissolved CO2 (green line), and decreasing pH (blue line; lower pH means higher acidity) over the past 30 years. 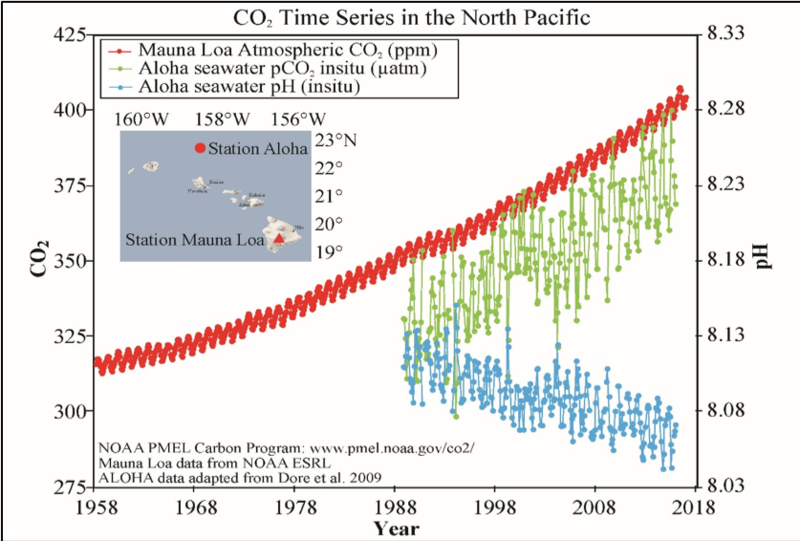 These ocean CO2 and pH trends are caused by increasing atmospheric CO2 (red line). Scientists estimate that about a third of all the CO2 emitted from burning fossil fuels is now dissolved in the ocean. That’s good news for the climate—the earth would be even hotter now if the ocean weren’t doing us a solid—but it’s bad news for the ocean. When water absorbs CO2, it becomes slightly more acidic. And indeed, the ocean has been getting more acidic ever since we thought to start measuring it thirty years ago. This process is called “ocean acidification.” What does ocean acidification mean for the health of the oceans? Just like you’d think, acidic water is generally not good for marine organisms, and a lot of research has shown its negative effects. For example, corals are getting stressed, oysters and clams are finding it harder to build their shells, and fish are losing their sense of smell. Those are all important things to study, but as a geochemist, I’m more interested in the fundamental chemistry of acidification, especially how acidic water might affect rocks (and vice versa, how rocks might affect acidification). I know what you’re thinking… Rocks?! Who cares!? But hear me out…they’re important. When acidic water interacts with certain kinds of rocks (like carbonates, which I study), it dissolves them, and the result of that dissolution sequesters CO2. So dissolving rocks with acidic water could ultimately help reverse climate change! This process is a kind of feedback mechanism that the earth naturally uses to regulate the amount of CO2 in the atmosphere. But unfortunately for us, it happens very, very slowly. My research is measuring exactly how fast this occurs in beach sands (sand, after all, is essentially just tiny rocks), and how much dissolution we can expect as the ocean becomes more acidic. To answer these questions, I’m starting local. I’ve spent the summer studying beach sands in southern California, focusing mostly on the beach in front of the Wrigley Institute. Water along the California coast is naturally slightly acidic, so it’s more vulnerable to increasing acidity, and thus a great place to study ocean acidification. To answer my questions, I’m using both lab-based and field experiments. In the lab experiments, I pump acidic water through columns of sand to replicate future ocean-beach conditions. I then measure the amount of rock (specifically, carbonate) dissolution that takes place under different acidity levels. This way, I can quantify how much dissolution—and associated CO2 sequestration—will take place over the next 25, 50, or 100 years. The field experiment uses a similar approach: I insert chambers into the sand and acidify the overlying water. As the acidic water mixes into the sand, some carbonates may start dissolving, sequestering CO2 in the process. Laboratory-based sand columns (left) and field-based chamber (right) used to measure carbonate dissolution. In both experiments, acidic water replicating future ocean conditions is pumped through the sand. I’m just starting to analyze my data, but it’s already clear that significant levels of carbonate dissolution will occur, even at near-future ocean conditions. This information will help predict the chemistry of California’s coastal water in the near-future. On a larger scale, it will also help ocean and climate modelers forecast global ocean/climate conditions. Extending the results of my research even further, we may be able to learn from the “natural” dissolution I’m measuring, and engineer new methods for carbon sequestration using acidic water and carbonate dissolution. Hence, although this research measures local processes, happening right under our feet (at low tide) or boat (at high tide), it could ultimately be important far beyond California! Before signing off, I want to send a big thank you to everyone who has supported my work. I’m funded by the Victoria J. Bertics Fellowship, which supports PhD research on sediments, and carries on Dr. Bertics’ enthusiasm for benthic ecology and chemistry. I also thank the incredible Wrigley staff for their infinite patience and dedication! And thank you for reading! This entry was posted in Graduate, Wrigley Institute on August 20, 2018 by Jessica Dutton. Microbes are charismatic, and no, they don’t get you sick! Well, at least about 99% of them don’t. As a matter of fact, we owe our lives to these tiny single-celled organisms. I’m not just talking about the significant rise of oxygen in atmosphere about 2.3 billion years ago, thanks to the early Cyanobacteria, but also in current times. All forms of microbial cells continue to shape our environment, making the Earth a habitable place by driving the biogeochemical cycles, processes in which elements change forms from inorganic to organic and back, catalyzed by biology. I am fascinated by the important roles that microbes play in these processes and very am interested in understanding microbial communities in their natural habitats: what species live there, how they interact with each other and how they interact with their surrounding environments, etc. A conceptual model of the sediment matrix. For my PhD thesis project in Dr. Wiebke Ziebis’s lab at USC, I have been studying a previously overlooked habitat — the interstitial space between the particles in marine sediments. This space, though seems trivial, takes up about 50 – 90% of total sediment volume. However, only a small portion of the benthic microorganisms live in this space, quite outnumbered by their particle-attached neighbors by orders of magnitude. Now let’s try to conceptualize the sediment frame: majority of the cells tightly attach to the sediment particles in multiple layers, forming biofilm, and there are “a few” (at least 106 cells ml-1, average cell abundance in the seawater) hanging out in the pore water. These are two completely different lifestyles, but conventional studies on marine sediments have never separated them. My goal is to bring the pore-water microbes to the center stage and take a closer look at this previously overlooked community. I have spent quite some time at the Wrigley Marine Science Center on Catalina Island throughout the years, and this is my third summer supported by the Wrigley Summer Fellowship. Doing research at Wrigley has been an amazing opportunity for me, thanks to the help from staff and the accessibility from the lab to my sampling site, the intertidal mudflat in Catalina Harbor, I am able to collect samples, transport them back and set up experiments smoothly so that the living organisms I care about are not disturbed too much. Since I can easily walk/drive to my sampling site, I can re-visit it whenever new samples are needed. It is through these trips, I have learned quite a few exciting facts about the pore-water microbes. 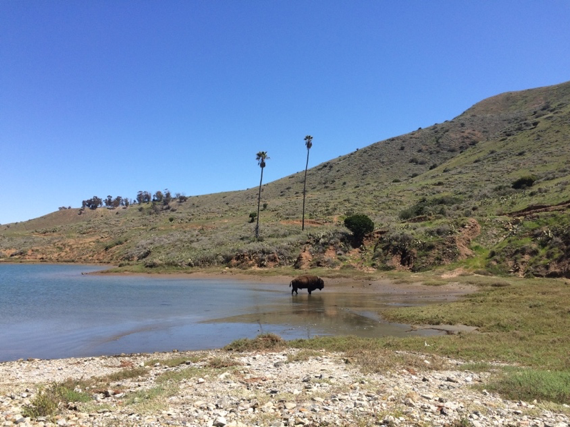 A beautiful day in Catalina Harbor, where a bison chills in the water. My previous studies found out that the pore-water microbial communities were quite abundant, averaging 107 cell ml-1. Not only were the pore-water communities 1 to 2 orders of magnitude higher in abundance than the seawater communities, they were also 10 times more diverse than the latter. The abundant microbial groups in the seawater were rarely found in the pore water, suggesting that even though the pore water is essentially seawater, there is little exchange of microbial communities between the two compartments. The more surprising contrast was between the free-living and particle-attached microbial communities: the former rivaled the latter in diversity, with less than a hundredth abundance of the latter. The two compartments shared about half of the microbial species in the surface layer, but became more and more different with increasing depth. The most exciting finding was that the pore-water communities were metabolically active, much more so than the particle-attached communities. Even though the pore-water communities were much lower in abundance, they were able to turn over acetate, a measure to evaluate their ability to turn over organic carbon, much faster than their particle-attached counterparts. This means that these free-living communities might play a very important role in benthic biogeochemical cycles. The wonder continues! When microorganisms oxidize organic carbon, they pass on the electrons from organic carbon to an electron donor (equivalent to us breathing oxygen), through which they gain energy for maintenance and growth. In a follow-up study to identify the electron acceptors used by the pore-water microbes, I found out that sulfate, a commonly used electron acceptor was disregarded by the free-living communities completely. The question is, why not, and what are the alternatives? With this question in mind, I went back to Catalina. Here we begin, another summer with day-to-day adventure! A typical working day on the island starts with sampling. I drive through a winding road with a breath-taking view to get to Catalina Harbor. 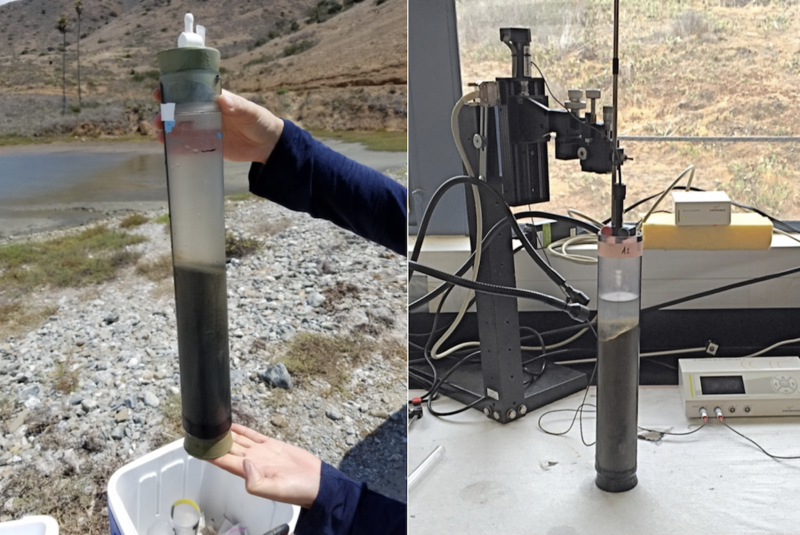 I roll up my sleeves and hammer a custom-made polycarbonate tube (~ 10 cm in diameter) into the sediment, seal the top, apply a vacuum and retrieve the tube with the sediments inside (we call this a “core”), carefully keeping it undisturbed. I take the core back to lab, and the do various measurements on the core to analyze the geochemical conditions the microbes live under. One of the measurements is oxygen concentration. 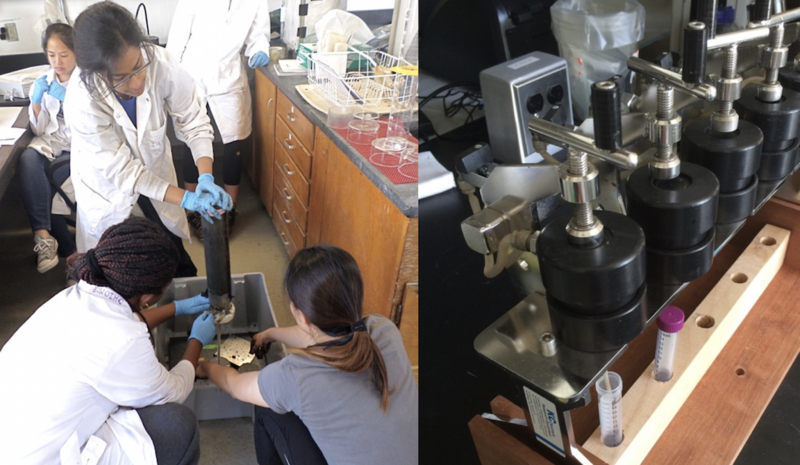 Left: Slicing a core with the help from USC undergrads. Right: A pore-water pressing bench. I then slice the core into different depth sections. From each section, I extract the pore water using a pore-water press, which gently expel the pore water from the sediment section under nitrogen atmosphere. The pore water and the remaining pore water-free sediment are used for further experimental setup. Today, I will try to enrich for microorganisms that “breathe” manganese oxide. As I mentioned earlier, one of my goals this summer is to figure out alternative electron acceptors the pore-water microorganisms use for energy gain. One hypothesis is that they use manganese oxide to dump electrons they get from organic material. To test for this hypothesis, I will use a fairly straightforward method: give them manganese oxide as the sole electron acceptor, together with other essential nutrients, wait and see whether anything grows. With the help from Casey Barr (a former Wrigley Summer Fellow and a fellow USC graduate student), I have prepared some culturing medium, synthesized manganese oxide minerals in a form that is known to be liked by manganese-reducing microbes, and mixed the two together in Hungate tubes anaerobically. What I need to do today is to inoculate the pore water and the pore water-free sediment into the culture tubes and cross my fingers! Since I am really writing this post a few days later after the day of experiment, I have news and it’s good! 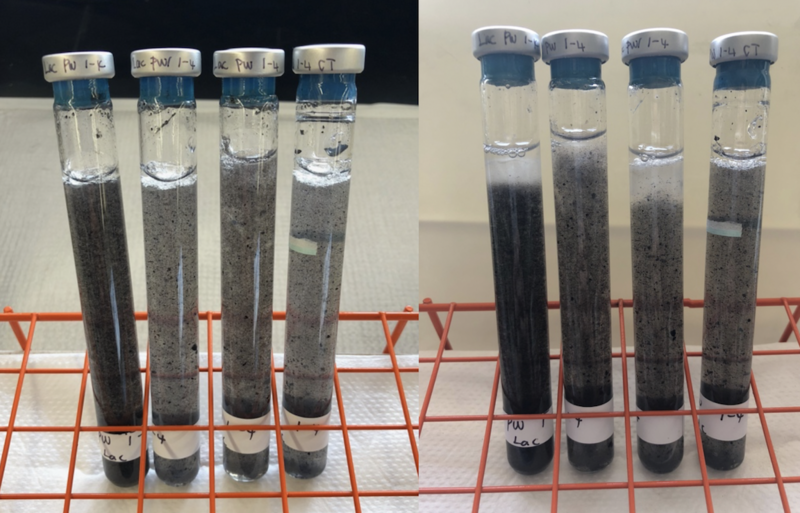 Left: A set of culture tubes with enrichment medium and manganese oxide (the black particles); Right: 10 days after the day of inoculation. Above is a picture of the culture tubes, and another taken 10 days after. See anything different? The black particles at the top of the culture tubes are disappearing in all three tubes from the left! The tube on the far right is a control, where the microbes were killed using mercury chloride so that they aren’t active at all. Therefore, the manganese oxides are really ridden by biology. So far, we can’t know for sure whether these microbes are directly reducing manganese, or if they produced something such as hydrogen sulfide that reduces manganese oxide indirectly. But it is promising. The next steps will involve the following: start a new batch of culture with sulfate-free medium to rule out the possibility of sulfide production; use electron microscopy to verify microbial growth on the manganese particles; and identify the potential manganese reducers through 16S tag sequencing. If the pore-water microbes indeed use manganese oxide as electron acceptor, not only do they gain more energy from manganese reduction, they have also avoided direct competition with the particle-attached microbes. This niche-partition between the free-living and particle attached communities is really an ingenious example of environmental selection and adaptation. I will be making more trips to my favorite sampling location throughout the summer and the fall. No complaints! This entry was posted in Graduate, Wrigley Institute on August 13, 2018 by Jessica Dutton.